The only drawback to the otherwise impressive iPod is that it doesn't allow you to transfer music from iPod to Mac computer with ease. Only when you resort to the iPod music manager or some programs, you can smoothly copy iPod music to MacBook, iMac or Mac mini. Which can help? This post answers your question with top three ways and guides you to transfer songs from iPod to Mac computer with greatest of ease. When you drive your car on the road and suddenly find its out of gas, you would feel highly frustrated, cuz you don't have backup gas supply. The same applies to iPod music files. When you encounter sudden loss of iPod music data, you are supposed to dread a lot, for you don't backup music from iPod to Mac computer, either. To avoid iPod music files loss, the ideal way is to transfer music from iPod to Mac for backup. Yet, you can't count on iTunes, which discourages you to transfer iPod music to Mac. To find a cure to this malaise, you're suggested to try the below three ways, which can help you get music off an iPod and copy music to Mac computer in a manner that is much easier than iTunes. 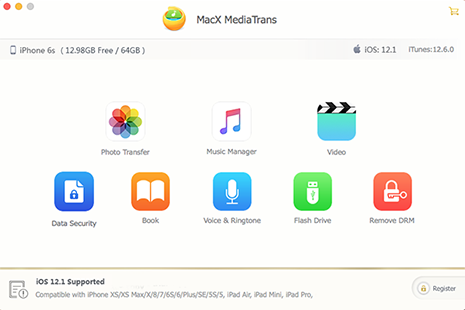 MacX MediaTrans, transfer free songs & purchased Apple Music from iPod to Mac. 1. Bulk copy and transfer iPod music (purchased Apple Music) to Mac, vice versa. 2. Create/edit/delete music playlist; make any song iPod iPhone ringtone, etc. 3. Transfer video, photos, ringtones, eBooks, etc. between iPod iPhone and Mac. Bulk transfer songs from iPod to Mac no matter the free MP3 music or Apple Music purchased M4P songs. Remove DRM protection from iTunes purchases and convert M4P to MP3, iTunes M4V movies to MP4, M4B audiobook to MP3, etc. Manage iPod iPhone iPad music library: create/edit music playlist, edit artist info, bulk delete songs, set any song as ringtone, add music to iPod, etc. Transfer videos, photos, music, ringtones, eBooks, audiobooks, Podcast, etc. between iPod iPad iPhone and computer. Warm Prompt: For trail version, you are allowed to move music from iPod to Mac with 30 songs/day. For full version, there is no limitation on songs quantity. Free download this iPod music manager on MacBook or iMac and then launch it. Plug your iPod into Mac computer via USB cable. 1. Upgrade iTunes to the latest version, for this iPod transfer tool needs iTunes to detect iPod. No worry! It will not use iTunes during music transfer process. 2. There will pop up a window to advise you to properly set iTunes lest your iOS device data gets lost. So please follow the prompts to set iTunes first. Press "Music" icon on iPod manager's main interface. Tick iPod music songs or just tick "Select All' to choose them all. Hit "Export" button and this iOS file transfer tool will begin transferring music from iPod to Mac without using iTunes. With Intel QSV supported, it can finish the job in secs. 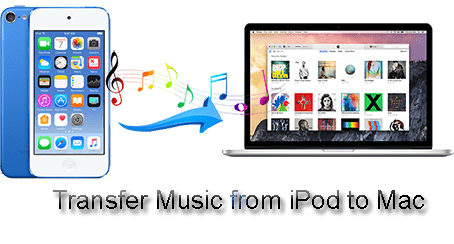 If you wanna transfer purchased Apple Music M4P from iPod to Mac for later playback on Android or other MP3 player, you can follow the below guide to remove DRM from Apple Music and transfer purchased songs from iPod to Mac without any further ado. Step 1: Choose the purchased Apple Music songs you wanna transfer to Mac. Step 2: Tap "Decode" if you want to decode the iTunes encrypted M4P music; or hit "OK" if you don't need to decode iTunes DRM-ed music, and then press "Export" button to directly copy purchased music from iPod to Mac. Step 3: To decode iTunes DRM-ed M4P music, sign in to the iTunes Store on your Mac with your Apple ID; afterwards, hit "Next" button to continue. Step 4: Click "Export" button to transfer purchased music from iPod to Mac after the copyright protection removal is over. Open the Apple Music on your Mac with VLC or other player and you can see it's now formatted with MP3, which means you can transfer iPod Apple Music to Android, MP3 player, game consoles for enjoyment. with the removal of Apple Music DRM, the usage range of your Apple Music files is expanded, not only limited to Apple device and iTunes. Yet, you're only allowed to use these decrypted Apple music files under fair use. Abide by Apple terms and conditions. DO NOT use these DRM-free music files for any piracy or illegal activities. As is known to all, one of the reasons why we can't directly transfer iPod music to Mac after connecting to Mac is that the music files are hidden by Apple. We can't directly view the music files unless we get the help from a hidden file viewer like Houdini. It's a simply free application to let you make full use of Mac OS X's "hidden folder" and "hidden file" ability to create, move and access to hidden folders/files, iPod music files hidden by Apple included, as well. Consequently, we can move music from iPod to Mac after we find the location of music files under the help of Houdini. How to make hidden iPod music files viewable? Read below. Step 1: Connect your iPod to Mac via USB cable, and fire up iTunes to detect iPod data. Followed by a click to "Options" and a tap to "Enable disk use." iTunes will pop up a warning: choose OK. Step 2: The current iPod is turned to be a USB drive on your Mac. 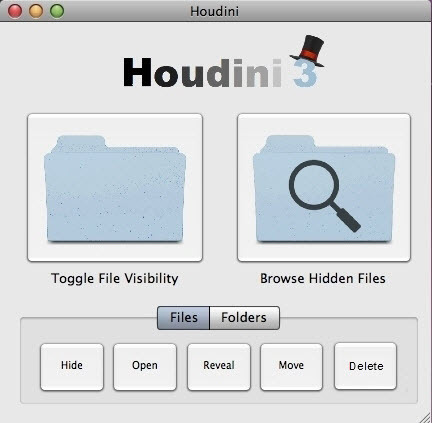 Prior to accessing to iPod files, download and install Houdini on macOS. This application is aimed to help you view the music folder that's automatically hidden by Apple. Step 3: Launch Houdini → click "Folders" → tap "Reveal" Locate your iPod, and open "iPod_controls". Highlight "Music" and opt for "Choose". Step 4: Open iPod_Controls > Music in your iPod folder. Drag the music folder you wanna transfer to the destination folder on your hard drive. After the iPod music transfer is finished, you can see the iPod music files are already saved on your Mac. For those who don't plan to download any music transfer software to add iPod music to Mac, you can consider to change settings on iPod to make hidden MP3 files visible via the program Terminal. In case you have no idea about Terminal and how to use Terminal to help transfer iPod songs to Mac, it doesn't matter and you don't have to. You just follow the below guide to change settings on iPod step by step. Step 1: Head to Application → choose Utilities → open 'Terminal' on your Mac. Step 2: Type the following in the Terminal: "defaults write com.apple.Finder AppleShowAllFiles YES". 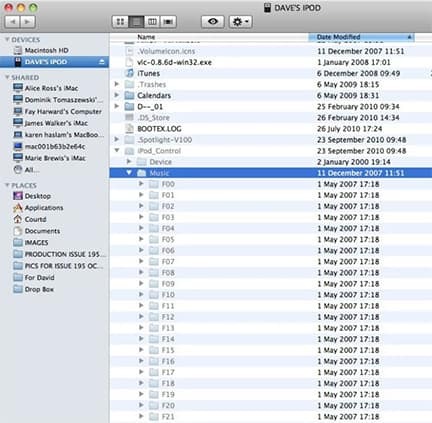 This is a command to force your Mac to show all files, even the music files hidden by Apple on your iPod. Step 3: Force quit your Finder and relaunch it. Step 4: Open iPod_Controls > Music in your iPod folder. Then paste music songs to the desired folder on your Mac. Tip 1: Remember copy MP3 songs themselves rather than the folders since once you restore the hidden folder settings your music will be hidden again. Tip 2: If you find that the music file is titled with some scattered letters or numbers, don't be panic. It will be back to normal once you import the music into iTunes or other MP3 players. The latter two ways can export music from iPod to Mac computer, but they don't have the ability to remove DRM from Apple Music. 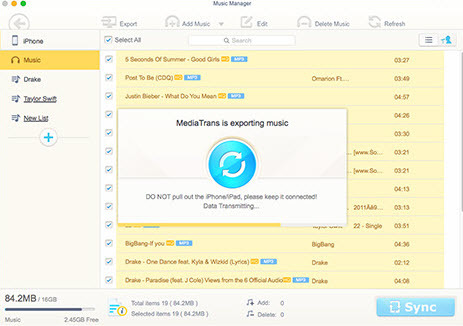 Hence, if you wanna decrypt iTunes DRM from Apple Music and expand iPod purchased music usage range, the first iPod music transfer tool is your best choice. MacX MediaTrans - Intel QSV accelerated speed to bulk sync music from iPod to Mac with free MP3 music or iTunes protected M4P music. Also a top performer to let you create/edit/delete music playlist, make any song ringtone, import music to iPod, etc.